No need to surf the tube in search of your Daytime Drama fix! Take a cue from Emmy Award-winning Makeup Artist, Jim DeMarco, who has been glamming up soap stars, models, and red-carpet starlets for years. Jim joined forces with us and created a must-have, travel-friendly kit to get you camera ready in a snap this holiday season!. Emmy-Award Winning Makeup Stylist, Jim DeMarco has been transforming faces on TV, runway and print for the past ten years. From every major runway show from Marc Jacobs to DIOR, Jim’s worked with the world’s best supermodels including Gisele Bundchen, Adriana Lima, Jessica Stam and Trish Goff. For the past four years, he has served on the makeup team on ABC’s Daytime Drama, ONE LIFE TO LIVE (2009 Emmy Winner). Other work can be seen on Bravo’s TOP CHEF and PROJECT RUNWAY as well as NBC’s upcoming season of CELEBRITY APPRENTICE III. The style and look of Jim’s work has also been seen on the red carpet at the GOLDEN GLOBES and DAYTIME EMMYS. Jim is based in New York City. For his latest work and reel, log on to www.jimdemarco.com. Visit our blog for Jim's step-by-step tutorial with application tips on how to get his signature camera-ready glow! 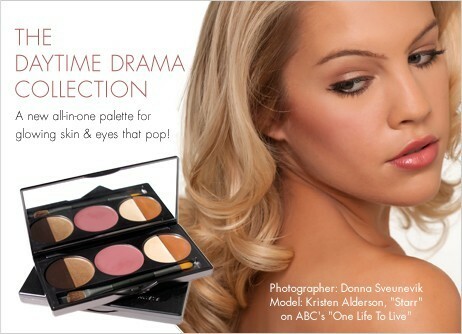 A new all-in-one palette for glowing skin & eyes that pop! Features new split pans in our signature refillable trio - a total of 5 shades for the eyes, lips, and cheeks!